FastPay is Kurdistan's quickest, most convenient, and safest mobile wallet for Shopping, Mobile recharge, Internet recharge, Money transfers and Bill payments. Use FastPay for a cashless, hassle-free experience while shopping, dining, travelling and a lot more! The above steps can be categorized in three sections based on the development process described below. The Steps 1, 2 and 3 are used to make the request for a new transaction. After getting confirmation of checkout from customer, merchant server sends a request to FastPay server to get a Session ID. If all the credentials and mandatory fields are valid, then FastPay provides a Session ID to Merchant System. After receiving the Session ID, Merchant System redirects the customer to payment page with Session ID. The Step 4 and 5 are processed at this stage. For any notification, FastPay will send HTTP message in POST method called IPN Message to the Listener which is to be configured by the Merchant attheir FastPay Administrator Panel. After receiving the message, you must validate the message with Transaction Validation API of FastPay. At Step 5, FastPay will redirect the customer to merchant’s side. At this stage, Merchant will display the notification of Service Confirmation. After validation of the transaction that you have received, Depending on the status you have to update your transaction in your Database. The status will Success, Failed, Cancelled depending on payment status. 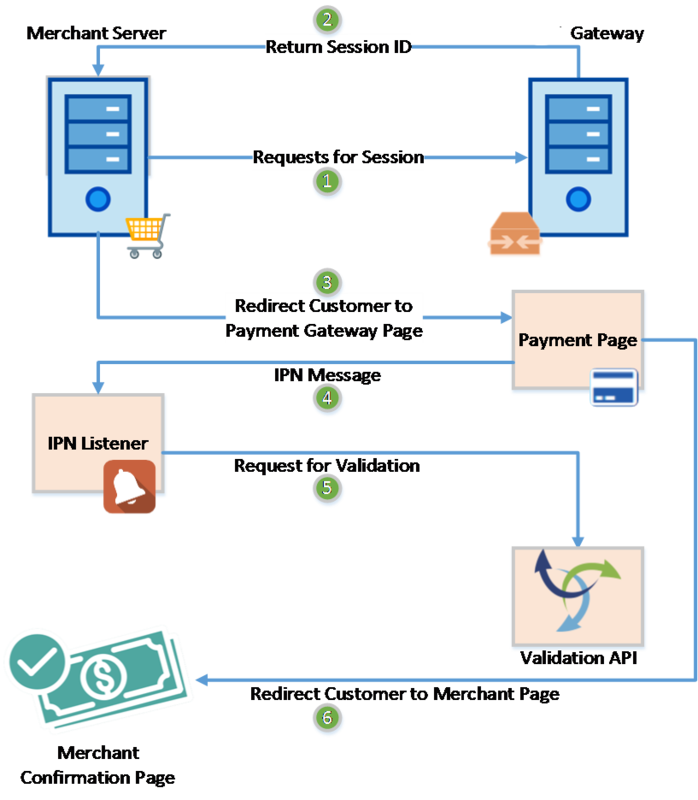 For initiating payment processing, at first you need to enable HTTP IPN Listener to listen the payments. So that you can update your database accordingly even customer got connectivity issue to return back to your website. Parameters: Your ready array variable in previous step. Remember, We have set an IPN URL in first step so that your server can listen at the right moment when payment is done at FastPay End. So, It is important to validate the transaction notification to maintain security and standard. As IPN URL already set in panel. All the payment notification will reach through IPN prior to user return back. So it needs validation for amount and transaction properly. $code = $result->code; #if $code is not 200 then something is wrong with your request. So, Your order and amount validated and it is ready for update in your database. If status is Valid and validation status Valid then update your database according to the status. and wait for your user to your website to show him/her the success, fail, and cancel page.